For the Cagayan River in Mindanao, see Cagayan River (Mindanao). The Cagayan River, also known as the Rio Grande de Cagayan, is the longest river in the Philippines and the largest river by discharge volume of water (followed by Rio Grande de Mindanao). It has a total length of approximately 350 kilometres (220 mi) and a drainage basin covering 27,753 square kilometres (10,715 sq mi). It is located in the Cagayan Valley region in northeastern part of Luzon Island and traverses the provinces of Nueva Vizcaya, Quirino, Isabela and Cagayan. The river's headwaters are at the Caraballo Mountains of the Central Luzon at an elevation of approximately 1,524 metres (5,000 ft). The river flows north for some 350 kilometres (220 mi) to its mouth at the Babuyan Channel near the town of Aparri, Cagayan. The river drops rapidly to 91 metres (299 ft) above sea level some 227 kilometres (141 mi) from the river mouth. Its principal tributaries are the Pinacanauan, Chico, Siffu, Mallig, Magat and Ilagan Rivers. The Pinacanauan River, seen just below the Callao Caves, is one of the major tributaries of the Cagayan River. Magat River, is the largest tributary with an estimated annual discharge of 9,808 million cubic meters. It lies in the southwestern portion of the basin, stretching approximately 150 kilometres (93 mi) from Nueva Vizcaya down to its confluence with Cagayan River about 55 kilometres (34 mi) from the river mouth. Both Magat and Chico Rivers have extensive drainage areas which comprise about 1/3 of the whole basin. The Ilagan River originates from the western slopes of the Sierra Madre and drains the eastern central portion of the Cagayan River basin with an estimated yearly discharge of 9,455 million cubic meters. It flows westward and joins the Cagayan River at Ilagan, Isabela, 200 kilometres (120 mi) from the mouth. The Siffu-Mallig system lies on the slope of the Central Cordillera ranges flowing almost parallel to the Magat River. Marshes and swamps are found in some parts of its lower reaches. Cagayan River and its tributaries have deposited sediments of Tertiary and Quaternary origin, mostly limestone sands and clays, throughout the relatively flat Cagayan Valley which is surrounded by the Cordillera Mountains in the west, Sierra Madre in the east and the Caraballo Mountains in the south. The river has a drainage area of about 27,300 square kilometres (10,500 sq mi). in the provinces of Apayao, Aurora, Cagayan, Ifugao, Isabela, Kalinga, Mountain Province, Nueva Vizcaya, and Quirino. The estimated annual discharge is 53,943 million cubic meters with a groundwater reserve of 47,895 million cubic meters. The Cagayan River and its tributaries are subject to extensive flooding during the monsoon season in Southeast Asia from May to October. The average annual rainfall in 1,000 millimetres (39 in) in the northern part and 3,000 millimetres (120 in) in the southern mountains where the river's headwaters lie. Water from the mountains flow down very slowly because of surface retention over the extensive flood plain, the gorges in the gently-sloping mountains and the meandering course of the river. The inundation of the Cagayan River and its tributaries have caused great loss of life and property and substantial losses to the local and national economies. The Philippine government has established several flood warning stations along the river. Experts are specifically monitoring the lower reaches from Tuguegarao to Aparri and the alluvial plain from Ilagan to Tumauini, Isabela. The Cagayan River passes through one of the few remaining primary forests in the Philippines. It supports the lives of numerous endemic and endangered species, like the Luzon bleeding-heart pigeon (Gallicolumba luzonica), Philippine eagle (Pithecophaga jefferyi) and a rare riverine fish, locally called ludong (Cestreaus plicatilis). The ludong spawns in Cagayan River's upper reaches in Jones, Isabela. In late October until mid-November, the fish travel down the river to release their eggs at the river mouth near Aparri. In February, ludong fry by the millions are again caught in fine nets as these travel upstream. Due to the dwindling number of ludong caught yearly, local governments have imposed a ban on catching the fish and its fry, but the ban has failed. The river traverses four provinces: Nueva Vizcaya, Quirino, Isabela and Cagayan. These provinces have an approximate population of two million people, mostly farmers and indigenous tribesmen. The Ibanag people derive their tribe's name from Cagayan River's ancient name, Bannag. The Gaddang tribe lived in the upper reaches of the Cagayan River and its tributaries. The river drains a fertile valley that produces a variety of crops, including rice, corn, bananas, coconut, citrus and tobacco. There are dams in two of the river's tributaries, the Magat and Chico Rivers, and there are also several mining concessions in the mineral-rich Cordillera Mountains near the headwaters of the two tributary rivers. The provincial governments along the river have also developed tourism programs that offer activities on the river, particularly whitewater rafting. ^ "Cagayan River - River, Philippines". www.britannica.com. Encyclopedia Britannica. July 20, 1998. Retrieved 5 April 2017. ^ "Taming the Cagayan River, Inquirer.net". Retrieved 20 May 2017. ^ "Longest Rivers In The Philippines, World Atlas". Retrieved 20 May 2017. ^ "Flood Forecasting and Warning System for River Basins; The Cagayan River Basin". Philippine Atmospheric, Geophysical and Astronomical Services Administration. Retrieved 12 March 2016. Wernstedt, F. L.; J. E. Spencer (1967). The Philippine Island World. Berkeley and Los Angeles: University of California Press. 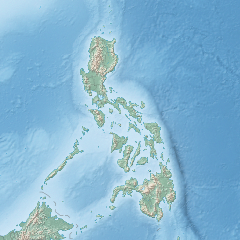 Wikimedia Commons has media related to Cagayan River.